The Holiday Bling Blog Hop is the brainchild of Shelley Graham Turner and Marlene Cupo. The idea was that these wonderful ladies would pair us up and we would create some holiday bling for our partners be it jewelry, ornaments or whatnot. My partner Tanya Boden and myself both decided to slightly veer off the idea of holiday bling and instead decided to send something that could be worn at any time of year. I think that we both accomplished that idea. Unfortunately Tanya decided to drop out of the hop so I will be showing you both what I sent and what I received from her. Tanya has metal allergies so this necklace is made of sterling silver with a sterling clasp. The stones are sapphire. This design actually came to me in a dream specifically meant for Tanya and hope that she wears it in love and health. Tanya actually sent me three pieces, a necklace and two bracelets. I just love the color in the necklace. I am a redhead so it fits well with my wardrobe and is one that I will definitely wear year around. Both bracelets are just pure fun. I fell in love with the alligator bead and all those lampwork beads. 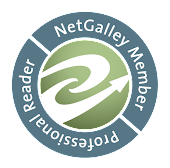 Now that you have seen my not so blingey bling be sure that you check out the other blogs and see what everyone received. I love that you made this hop your own. So thrilled that you and Tanya have beautiful new pieces to wear this holiday season and beyond. I just love how everyone has a unique interpretation of the "bling". That dream-inspired silver and sapphire necklace is something anyone would be proud to wear, winter or summer, Shaiha! And Tanya's adorable gifts to you... so colourful and playful. They would cheer even the gloomiest day! Hope you have a wonderful and peaceful Holiday season! Your silver and sapphire necklace is amazing. I think lampwork and semi precious stones are very blingy in their own way! I love your necklace! It is stunning! I hate to hear that Tanya had to drop out but the 3 pieces she did send are awesome! Yay! Wow what beautiful pieces. First I wish I had dreams like yours if they produce this kind of beautiful ideas. The necklace is stunning I'm sure she will enjoy it for many years to come. The neckace and bracelets she sent to you are beautiful also, they look like they will be great to wear everyday of the year. You both did very gorgeous work. Beautiful work! Shaiha, your necklace is awesome! I love the look of it, and Tanya's pieces are so pretty. Hoping she's feeling better, and thank you for showing off both gifts. The necklace you designed is beautiful. 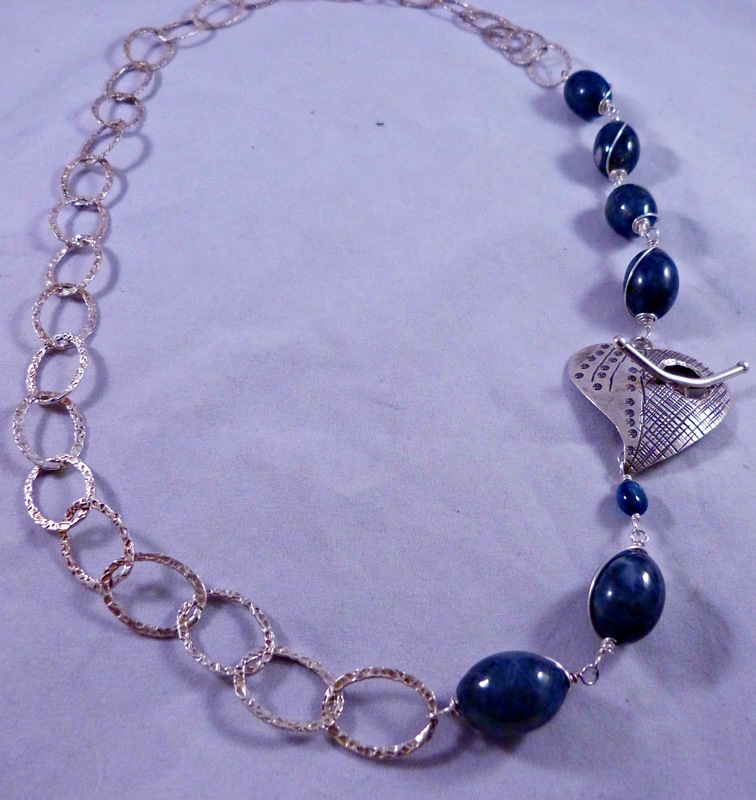 Love the blue sapphire and silver together, and your wire wrapping is exquisite Shai! Very cool, and I love the gator, too. More hearts for the holidays, that's what it's all about, isn't it? Nice gifts! I love that alligator bead, too! Shai, you did a magnificent job on that necklace! I am sure your partner is blown away by it. I know I am. The pieces you received are also great, especially like the alligator (maybe 'cause living in Fl, that is the best way to see them LOL). Thank you for being in our HBBH! I offered you the help of two doctors that are not only my family friends, but beautiful healers. You were sharing your cancer diagnosis with me. This was on the harvest moon. After that, I never heard back from you. I've seen and read your posts many places and times since then. Grandmothers like me, the crones, the wise ones, live with their hearts open. I pray healing for you! Positive thoughts sent your way! That necklace is to die for. Beautiful!! I love your gifts. Oh my, your necklace is completely exquisite! I love that it came to you in a dream, and that you created the most gorgeous stations of sapphire. The gemstone's energy just comes right through -- so healing, and powerful. What an honor it is for your partner to receive such a wonderful holiday gift! Sapphire is a wonderful talisman too - the gift of a precious gem in your amazing wire art is as sacred as the gem itself. I looked up its meaning: honesty, sincerity and faithfulness. How beautiful your jewelry is, and what an amazing gift for the holidays. I think the alligator is adorable too! I'm in Florida also, like Marlene, and gotta love our gators here lol :) It's all very charming and fun. Happy Holidays, Blessed Be, and Merry we meet, merry we part! The sapphire bracelet is beautiful! Breathtaking! 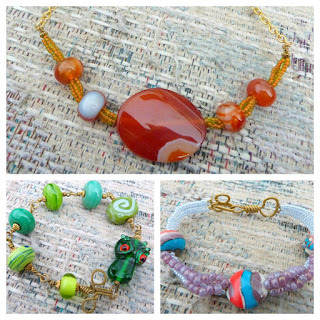 And the necklace and bracelets with lampwork beads - well - lampwork beads are my weakness! So, all I can say is - Oh MY! Oh, my - your sapphire necklace is exquisite! The wire work is perfect and the whole piece is so elegant and unique. Love it and I am sure Tanya will love it too! The pieces from Tanya are pure fun - happy and cheerful, lovely... that gator bead is so cute!